Going off-roading in your Wrangler JL can be fun but the rocks you encounter can be unforgiving. Make sure your rocker panels are well protected with a pair of rock sliders. Go Rhino's DSS Dominator Rock Sliders are the perfect solution for protection along with assisting you with getting in and out of your Jeep with the removable full length steel step. With their no drilling design these sliders are an easy to do upgrade to your JL making you stand out from your fellow Jeep enthusiasts. 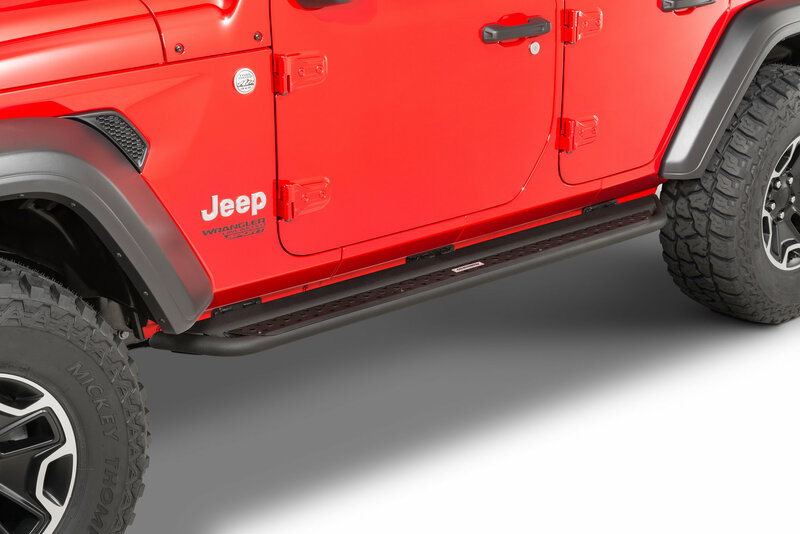 Full Length Coverage: Made of quality steel that is black powder coated these sliders will protect your rocker panels while acting as a side step with the removable steel step. Another great asset is the extra clearance you will gain for those rocky trails. Installation: By using the factory step and rock rail mount locations you will not need to drill or make modifications to your Jeep. Off Road Look: With a sleek look that screams you love to climb over rocks these sliders will make you stand out from the rest of the JL crowd on the streets and on the trails.